Oh, I do love to be beside the Seaside! I drove back to University the other day on my own, and the past couple of days here have just been so hectic! From meeting mentee's, talking in front of all of the new History students (which I hated), to trying to sort out my mess of a room! My week wasn't too busy, it was mainly preparing myself for going back to University! Me and my mum went to a farmer's market in the next village for the first time and came back with some of these lovely sunflowers, I made a peach and raspberry smoothie which was so delicious, if a little bit thick. I went to Ightham Mote with my boyfriend. 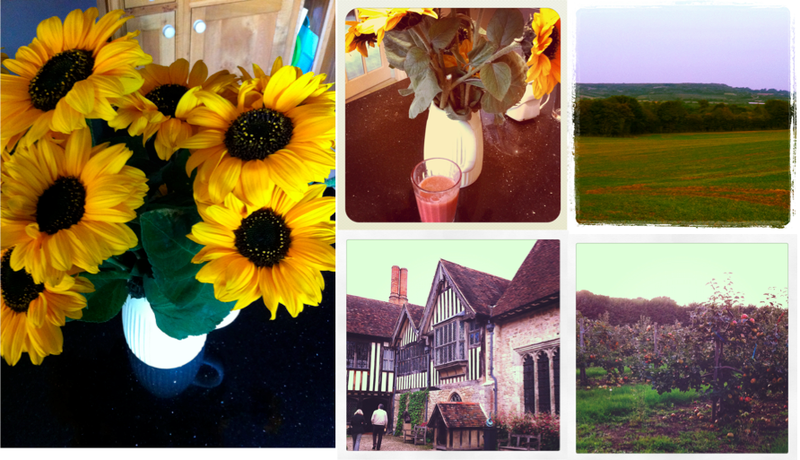 The last two pictures are of my last night in Kent, enjoying a walk in the Orchards and taking in the view! I miss it so much already. I was hoping to sort out a scheduled post for the Sunday whilst I would have been in the car, however I can't work it out! I tried it before and it was published at American time i'm guessing? I'm trying to get my hands on a pretty good camera, I've been wanting one for ages and now just seems the perfect timing, so get ready for pictures of much better quality! For some reason, I wasn't particularly looking forward to coming back to University, but now that I'm here, I love it! I feel so lucky that it's in a seaside town! I'm hoping to get some outfit posts going, and as soon as i'm all settled in there will be some more 'Historical Outing Posts' coming! Nice pictures! I can't get the scheduled posts to workshops properly, I think it has do with the time zones like you said! The sunflowers look so so gorgeous! <3 They are my absolute favourite flower!